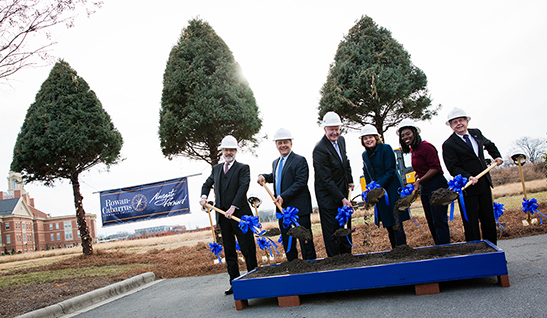 KANNAPOLIS, N.C.—Rowan-Cabarrus Community College has officially broken ground on a new Advanced Technology Center (ATC) at the North Carolina Research Campus in Kannapolis on January 22 with the site of the new Advanced Technology Center in the background. The groundbreaking event included remarks from the College’s partners in this significant effort including Board Chair Carl Short, Jr., Cabarrus County Commission Chair Steve Morris, Vice President of Castle and Cooke North Carolina Operations at North Carolina Research Campus Mark Spitzer, Kannapolis Mayor Darrell Hinnant, Student Government Association President Liana Walker and President Carol Spalding. The event also featured technology-focused appetizers provided by North Carolina Research Campus Partner, Mark Allison, who serves as Dole Food Company’s Director of Culinary Nutrition in alignment with Dole’s partnership with Disney. The Advanced Technology Center project is the result of collaborative funding by both private and public partners. The combined efforts and support of the Cabarrus County Bond Referendum ($9 million), Cabarrus County funding ($8 million) and additional funding from the Rowan-Cabarrus Foundation’s Building a More Prosperous Community Major Gifts Campaign make the creation of this new building possible. The ATC will be built on nearly three acres of land that was generously donated by David Murdock through the collaborative efforts of Vice President of Castle and Cooke North Carolina Operations at North Carolina Research Campus Mark Spitzer, College President Carol Spalding and Kannapolis Mayor Darrell Hinnant. 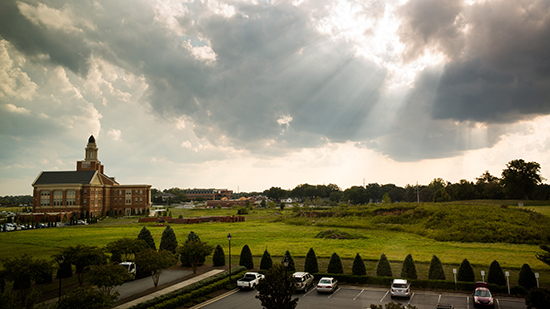 Rowan-Cabarrus views the new advanced technology center as both a place and a culture. The ATC will support lifelong learning in emerging, incumbent, and transitioning workforces in addition to assisting business operations in the surrounding communities. “The creation of this Advanced Technology Center is about more than a building – it’s a sign to our community and companies that this region is committed to developing a workforce to accommodate and support high-tech, advanced technology careers,” said Craig Lamb, vice president of corporate & continuing education at Rowan-Cabarrus. The ATC will showcase the latest innovative and leading edge technology in all supported programs, as well as serve as a partner for businesses and industries by promoting new careers and offering business solutions. A competitive request for proposal process was completed and Little Diversified was selected as the architect for the project, Rodgers Builders, Inc. has been selected as the construction manager-at-risk, Bullard Associates Engineers has been selected as the low voltage systems designer, and McCracken & Lopez, P.A. has been selected as the commissioning agent. State and private funds play a large role in supporting the equipment needs of the ATC. The practical and authentic environment created at the ATC will focus on applied technical training and will consist of industry-standard equipment, authentic workspaces, virtualization opportunities, practical application of classroom learning, and “worksite” exposure for high school and middle school students. “I believe our new ATC will stimulate the growth of high-tech, high-wage jobs that will allow workers to prosper, businesses to profit, and our communities to grow,” said Carl M. Short, chair of the Rowan-Cabarrus Community College Board of Trustees. 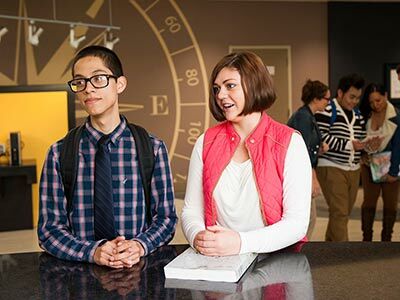 The College plans to anticipate and respond accordingly to future technology changes and has designed the new advanced technology center to support industry growth for the next 50 years. The ATC will offer advanced levels in numerous programs, including interdisciplinary projects and capstone experiences for students. Students will work on equipment in the ATC that is currently in the workplace and get hands-on experience to learn and improve their skills. The ATC will also provide flexible spaces with adaptable technology that can be adjusted to meet industry standards. “When looking around this growing area, I know this groundbreaking is more than a literal symbol, but a figurative representation of a better tomorrow. This building is not just an investment in the students, but also in the community,” said Liana Walker, 2017-2018 Student Government Association president. The ATC will include 12 practical and integrated labs and seven general and computer classrooms. The labs will feature a large flex lab on the ground floor, which will allow the College to provide space for our industry partners to assist in working through their production line challenges. The building will also have a student lounge and collaboration areas, and a useful lobby. There will be seminar spaces, which will enhance the ability to host community partners, as the College currently does in the adjacent North Carolina Research Campus location. Office spaces will also be provided for administration, faculty, and some industry partners. For more information about Rowan-Cabarrus Community College, please visit www.rccc.edu/apply or call 704-216-RCCC (7222). 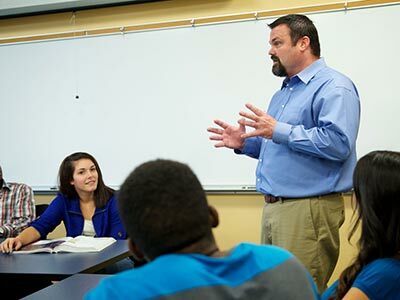 The College is currently accepting applications for spring 2018 eight-week classes that will begin March 16, 2018.